Slurry sleeves: Pure Gum Rubber, Buna-N, EPDM, and Viton. Red Valve’s Flexgate valve is designed with a cast iron body or fabricated steel body, stainless steel gate, and two heavy-duty elastomer cartridge slurry seats. The port is formed by two heavy duty cartridge elastomer slurry seat halves. The cartridge slurry seats are available in various elastomers for chemical compatibility and abrasion resistance. A flush area at the valve’s base provides a clean-out port. The Flexgate valve provides bi-directional shutoff. A heavy-duty topworks is standard.The relatively simple design eliminates expensive overhauls, unscheduled shutdowns, and costly replacement parts – the only replacement parts are the slurry sleeves and the packing. Flexgate valves of 3″-12″ are provided with standard handwheel mechanisms featuring cast handwheels, machined 303 stainless steel stems with yoke sleeves, and thrust washers designed to reduce operating torque. 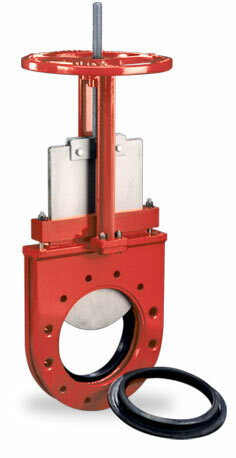 It is recommended that Manual Flexgate Valves 12″ and larger be specified with a 4:1 bevel gear actuator. The 4:1 bevel gear actuator is available to reduce rim pull and operate the valve. Pneumatic actuators are also available, and allow the Flexgate to provide long-term abrasion resistance under high cycle conditions.The valve self-cleans each time it is cycled, making it ideal for automated plants. Red Valve manufactures its actuators using black Amalgon, a fiberglass reinforced epoxy resin. The actuator material is inert to most corrosive chemicals, hydraulic fluids, water, and oil. It has an operating temperature range from -90° to 225° F, and can withstand maximum working pressures of 250 psi. Inside actuator walls are polished and impregnated with a moly-disulfide for reduced friction and wear. The piston seal is a long-lasting O-ring. The piston rod is sealed with a lip seal, which is protected by a rod wiper ring. This wiper ring prevents dirt from being dragged though the seal.Red Valve’s Flexgate Valves are also available with hydraulic or electric actuators. Other options include limit switches, solenoids, air regulators, and chainwheels.